The large carnivores roaming the Finnish wilderness include the brown bear, the wolf, the lynx and the wolverine. They are rarely seen in the wild, but they do leave behind signs of their existence: tracks, droppings, carcasses and broken ant hills and tree stumps. Large carnivores can also be heard: lynxes tend to growl in the spring and wolves like to howl, especially in the autumn. It might be difficult to identify the tracks of large carnivores in the wild. The tracks of a wolf, for example, resemble those left by large dogs. – A wolf's paw print is usually longer than it is wide, whereas a dog's paw print is usually round. It is still difficult to tell from an individual print whether it is definitely a dog's or a wolf's. Instead, the way the animal moves and behaves gives away the species, says Antti Härkälä, a research expert at Natural Resources Institute Finland (Luke). You can learn to identify both the tracks and sounds of the animals at suurpedot.fi. An animal can also be identified by its droppings. – Because the wolf eats meat, its droppings are dark and solid. The poop of a house dog that eats processed food is lighter in tone and less solid. Hair of prey animals is also often visible in wolf droppings, Härkälä concludes. All sightings of large carnivores should be reported to the predator contact person of the local game management association, who will then verify the sighting and log it in the Tassu (Finnish for Paw) sighting system. – The reporting of sightings is important, as the sightings help us determine the distribution and population numbers of large carnivores. The Tassu system is also used by the authorities and it is used as a basis for making various licence decisions, says Härkälä. 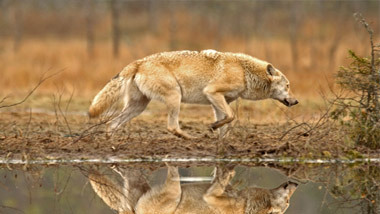 Reporting a large carnivore sighting does not mean that the sighted wolf will be immediately chased, for example. Not by any means. – It is a data collection method with which we are trying to piece together all large carnivore sightings comprehensively across Finland. The more we know about these animals, the better we can make decisions regarding their conservation and hunting, Härkälä says. Every large carnivore sighting is valuable in determining population numbers. Data on the movements and numbers of large carnivores is also collected with tracking collars, cub sightings, wildlife population censuses and by keeping track of the number of hunted animals. – With modern technology we can analyse a wolf's droppings and isolate individual DNA that allows us to create an identifier for that particular wolf, for example. DNA samples give us detailed information on the movements of individual animals as well as packs of animals, says Härkälä. Spring is a time of change in the lives of large carnivores. Bear cubs have already been born in the winter den, the mating season of wolves is over and the pups are born in early May. 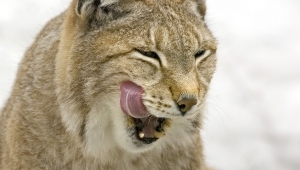 The lynx also gives birth in May/June. Even though a large carnivore will rather avoid humans than prowl on us, you should never try to find a bear that has just woken up from hibernation, or follow a litter of wolves playing in the moss. – Wolves and bears will usually detect humans before humans can detect them. The human might not even get a glimpse of the animal as it has already scurried away. If a large carnivore and a human come face to face, something has gone wrong. The human might have stumbled upon a bear's winter den, for example, or been caught between a mother bear and her cubs by accident, says Härkälä. If you end up meeting a large carnivore in the wild, you should withdraw from the scene calmly. Get to know the tracks and sounds of large carnivores online at suurpedot.fi. If you come across tracks left by large carnivores, notify the local game management association. The association's contact person may be found in the national database of local game management associations and the Finnish Wildlife Agency, which is available online at riista.fi/en/game-administration/contact-information/. An ordinary person does not have access to the Tassu sighting system, but everyone can view a less detailed map of large carnivore sightings in Finland at riistahavainnot.fi.